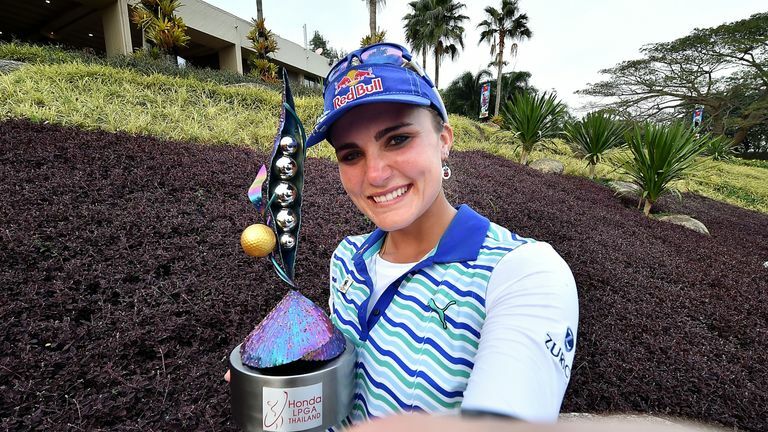 A big congratulations goes out to Lexi Thompson for winning the Honda LPGA Thailand. It was quite a performance, and although she was pressed by In Gee Chun for most of the final round, she won by a very comfortable six strokes. It was the 7th LPGA Victory for the 21 year old superstar. Lexi Thompson has now added a 7th LPGA trophy to her fast growing collection. This week the LPGA moves to Singapore for the playing of the HSBC Women's Champions. This tournament was won in 2015 by Inbee Park, who held off the charging Lydia Ko for a two stroke victory. This will be tournament #5 of 33 on the 2016 LPGA schedule. Course: Sentosa Golf Club, The Serapong Course. My strength of field rating is a very strong 79% (up from 70% last year). This will be one of the stronger non major championship fields that you will see this year. Forty-nine of the top 50 players on the LPGA Priority List (Line Vedel is out with an injury) will be teeing it up this week. Forty-three of the top 50 players from the Rolex Rankings will also be in attendance. The only reason why my field rating isn't higher, is that this is a small field of 63 players, and lacks the the depth of a major championship. Players that did not get into the field include: Q-Baek, Jaye Marie Green, Wei-Ling Hsu, Caroline Masson, Danielle Kang, Catriona Matthew, and Moriya Jutanugarn. Those players, and a few others, are good enough that their absence does lower my rating. My alternates are: Shanshan Feng, Haru Nomura, and Chella Choi. It is still early as we still have 29 more contests this year. Ariya Jutanugarn was assessed a 2 stroke penalty for showing up late at at the first tee of the first round. Xi Yu Lin won a brand new automobile when she aced the 16th hole of round 2. The battle to qualify for the Korean International Crown team is a fierce one. They currently have 7 players in the top 15, but the maximum per country is 4 players. As of today's rankings Inbee Park (#2), Sei Young Kim (#5), In Gee Chun (#6), and Amy Yang (#7), would make the team. So Yeon Ryu (#8), Ha Na Jang (#10), and Hyo Joo Kim (#11), would not make the team. This is going to change on a weekly basis, and definitely bears watching. Lexi Thompson became the highest ranked American player this week as she passes Stacy Lewis and moves up to #3 in the world. In Gee Chun leaps up from #10 to #6, while Amy Yand jumps up from #12 to #7. On the downside, Hyo Joo Kim falls out of the top 10, falling from #8 to #11. Ha Na Jang leads with 790 points. She is followed by Haru Nomura with 730, and Lexi Thompson with 634. Lexi Thompson has 3 wins and 9 top ten finishes in her last 13 starts, dating back to last year. Only Lydia Ko with 3 wins and 10 top tens over that same period has done better. Ha Na Jang and Haru Nomura are the only players to finish in the top 15 in all four of this year's tournaments. Morgan Pressel has failed to register a top 50 finish so far this year. For full scoreboard see link on top of this page. What is Q Baek's real name? That was some performance by Lexi last week. I think the biggest thing to stand out was her margin of 31 strokes she beat a fully fit Michelle Wie by! By my calculation the live coverage on JTBC Golf is starting at 10.30pm ET Thu/Fri and 10.15pm Sat/Sun. I'm not sure why the GC coverage is not showing all the live coverage considering the time slot.